Right Now, Debut album by X Factor series 4 winner, Leon Jackson. He has been hiding out for the Past Year. 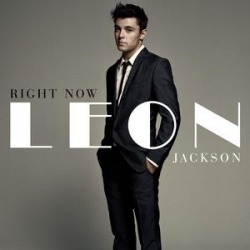 But now Leon Jackson has just released his fantastic debut album "Right Now". The Scottish Jazz, Pop singer who won the 2007 series of the British TV Show The X Factor. The album has now sold 250,500 copies in the United Kingdom Alone. In Ireland it has sold 10,200 & in total 260,500. The album has charted at #4 in the United Kingdom & #7 in Ireland. The album hasnt done as well as expected by Leon fans, making this the 1st debut album by a X Factor winner album not to chart at #1 in the UK Atleast. The 1st official single from the album "Don't Call This Love" has already been released and charted at #3 in the UK, Selling more than 100,000 copies.